TrollFoil™ is a very sensitive pre-mounted articulating foil. At only 8 micrometers thick it is the thinnest marking paper that I am aware of. The pre-mounted presentation of TrollFoil™ makes it quick and efficient to use and negates the need for mounting forceps. TrollFoil™ marks on highly polished porcelain (e.max) or gold crowns. TrollFoil™ has ink on both sides of the foil. 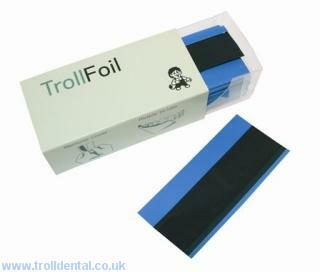 TrollFoil™ is one of my nominations for best product of the year. Incredible for e.max and significantly simplifies the occlusal adjusting process.